A detailed Vientiane fun guide, with a survey of Vientiane boutique hotels, guest houses, dining, shopping, nightlife, a Laos guide to hotels, by Vijay Verghese and more from Smart Travel Asia and Dancing Wolf Media. Laos on a shoestring and a Vientiane fun guide to hotels, guesthouses, temples, caves and “tubing” down the Mekong if you prefer to get wet. Fortunately for travellers, US dollars and Thai baht are accepted at restaurants and markets, though change may not be in the same currency. Carry small denomination notes (US$1 and Bt20) and you will be assured speedy and welcome passage. Officials emphasise that the Maoists who re-emerged in the northern hills on the Vientiane-Luang Prabang highway are being dealt with and security has been beefed up considerably along the farther reaches of this scenic road. 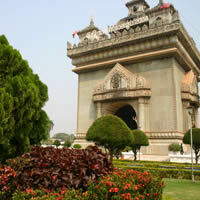 Most people prefer to fly from Vientiane, the capital, to Luang Prabang (Lao Airlines, tel: [856-21] 212-05154). The road journey is beautiful but endlessly winding, and it’s advisable to travel north by day, when accidents and banditry are less likely. The eight to ten-hour drive is best broken with an overnight stop at Vang Vieng, a laid-back town, pleasantly sited on the Nam Song River that runs through some stunning limestone outcroppings riddled with extensive caves. Unfortunately the town itself is becoming somewhat of a spring break destination for teenage pleasure seekers (many attracted by the prospect of drifting past floating bars all day on inflatables), so avoid the melee by finding a place to stay on the outskirts. The scenery however, is absolutely worth it, and a lot of great exploratory tours start here. A private taxi for a day trip to Vang Vieng from Vientiane will cost around US$80. Private taxis will do half-day hires in Vientiane for $30 and full-day for $60. For the intrepid, tuk-tuks will get you most places within downtown Vientiane for Bt20-Bt40, or less than a dollar. But don’t hesitate too long before you hop into one of these juddering motorcycle rickshaws. The government may be banning them soon to make way for a more modernised transportation system. Taxis from the airport to town are about US$8 and tuk-tuks, slightly cheaper. A slightly larger tuk-tuk, or jumbo, is a goodly size and ideal for carting families around when the weather is cooler. Winter months November to February can get chilly at night. Normal city cabs are unmetered so fix a rate before stepping in, as every Vientiane guide will advise. But back to the arrival. You will likely fly in on either the infamous Lao Airlines, or Thai International (www.thaiairways.com), from Bangkok. Those who dwell on details may wish to do a little Internet investigation before flying with the former, since local expats swear that certain plane models are more robust than others (and even suggest picking flights serviced by the one French engineer). We did neither though, and flew without a hitch. Bangkok Airways is the preferred Thai carrier to Luang Prabang. Wattay International Airport is minutes from town. 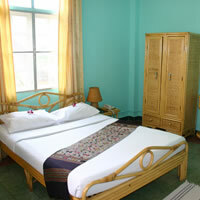 It is relaxed and friendly and visas are available on arrival (for all nationalities, bar none) for US$30. Bring two passport photos with you and dollars. If you haven’t got ready cash, authorities often permit you to exit the airport to exchange money while they hold on to your travel document. Try that in Los Angeles. I wandered through immigration unnoticed and explored much of this modest, but modern and functional, airport before remembering I had to get my passport stamped. 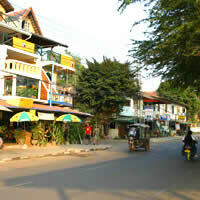 Vientiane is a quiet town on the banks of the Mekong River. Not a whole lot happens here and this is precisely what draws visitors. There are the usual dilapidated yet incredibly appealing French villas and some attractive wats (temples) but you’d be hard-pressed to fill a two-day itinerary. The two must-see landmarks are the Patouxay (pronounced “paah-too-sai”, or Victory Monument) and That Luang temple whose golden spires and stupas are particularly resplendent in the evening light. Pha That Luang is considered the most sacred of all Lao wats. Patouxay too wears a more appealing blush around sunset. It was apparently built from cement bought from the US expressly for the construction of an airport and it is jokingly referred to in expatriate circles as the “vertical runway”. Canard or not, the monument is largely cement with intricate archways and interiors all in a garden setting. Two other wats of note, though there are several characterful ones you will stumble across in the changing light, are Wat Sisaket – one of the oldest structures and home to many small silver Buddha images – and Wat Simuang. This is where I met Wallee, from the USA, middle-aged, shaven and content. He smiled and closed his eyes, beatifically – every time he drew a long puff from his cigarette. This was part of his brief internship as a monk, something most Laotians do at some time in their life. Across the road from Sisaket is Ho Prakeo, a temple-turned-museum. Early mornings are the best time, and light, as monks file past kneeling devotees who offer them alms. The setting sun lends a wonderful golden aura as well to the streets and temples and this is the perfect time to pull out your camera. Evenings are also the time for a sundowner or a cool Beer Lao along Vientiane’s riverside promenade, Fa Ngum Road (or Thanon Fa Ngum), where street stalls and eateries spring up in the cool, if dusty air along the banks of the Mekong, grilling fish stuffed with herbs and lemongrass. The food is delicious, cheap and clean. I didn’t get to try the “fried pock” though. Unlike Thailand, the water here tends to be bottled or filtered and is relatively safe. Ice is not a problem. The same goes for vegetables that have not, as yet, been blasted with DDT and pesticide. When I lived in Bangkok we looked for vegetables that were partially rotten, as a sign they were pesticide-free. I kid you not. Fa Ngum Road is also where you’ll find a string of trendy eateries catering for palates from Indian to French and Tex-Mex. The upper floor of Tex-Mex Alexia (tel:  241-349) is a decent spot to watch the sun go down across the Mekong. Thailand is on the other side of the river. Next door is the stylish salmon-wall interior Cote-d’Azur featuring cuisine from Provence, France for about $5 a dish, in a cosy setting. Close by are Indian restaurants Nazim which even produces South Indian masala dosas (rice and lentil pancake with spicy potato stuffing), and Taste of India (tel:  5515-182) which does decent North Indian and also a flavourful lemon-rice. There’s Szechuan food available at the Intercity Hotel. Sample Korean at Arirang, or sip a sundowner at the third-floor KLD Beergarden. The riverside district is a good hunting ground for eateries, most catering for budget palates. An excellent, simple choice is Sabaidee restaurant (tel: 214-278) on a corner of Setthathirat Road. There’s good Thai food, breakfasts, and just about anything you could want from BBC news on the telly to some resident cats for company. A vegetarian outdoor option is the Garden Fresh Restaurant just off Fa Ngum Road next to Samsenthai Hotel on Muntathulat Street, with meals starting at Kp12,000 (or practically nothing), or give the Teriyaki Tofu burger a go at Just For Fun, around the corner from the Banqu Pour Le Commerce Exterieur Lao. For more of a view you could brave four flights of stairs to the terrace of Bor Pen Nyang (tel: 261-373). The place has a slight pub feel to it, with an international menu and traditionally carved wooden furniture, though the stools could be a bit more comfy. Café Indochine (tel: 217-758) on Thanon Setthathirat is an airconditioned Vietnamese nosherie and for Cantonese there’s always the Hong Kong Restaurant (tel: 216-062) at the Settha Guesthouse, which often do good special offer meal sets for around US$2. Around the Fountain (Namphou), a square of sorts, are a series of very interesting restaurants, a step up from the riverside in ambience and price. These include the Italian L’Opera (tel: 215-099) where pizzas start at $5.50, Namphou Restaurant & Bar (tel: 216-248) with an authentic old world flavour, serving French and Asian, Restaurant La Cave des Chateaux (tel: 212-192), a small and cosy establishment with wines stacked around its walls and the Restaurant Le Provencal (tel: 219-685). For travellers craving a more traditional French option L'Adresse de Tinay (tel: 5691-3434, www.ladressedetinay.com) is worth a visit. This chic eatery is across the street from Wat Ongteu and serves up classical French dishes done right. They also have a good vegetarian selection. Don’t miss the ever popular Scandinavian Bakery (tel: 215-231). The bakery is not really a restaurant but it is a great meeting and chill-out place packed with all manner of quiches, cakes, croissants and sandwiches. There is a busy noticeboard outside with scribbled prices for cars, tours, kids’ centres and more. An undisputed traveller favourite is Makphet restaurant. This restaurant serves up Lao and fusion dishes, often mentioned as some of the best meals in Laos. Aside from enjoying a delicious meal, you will also be supporting a good cause. Proceeds from the restaurant go to Friends International to help disadvantaged youth. For a more upmarket, and indeed organic, bakery experience walk a few minutes to JoMa’s on Sethalit Rd (tel: 215-265), or try the chilled out DaoFa Bistro on nearby Sisavangvong Rd. Nearby at the Laos Culture House, the Lotus Restaurant presents a refined indoor and outdoor dining spot, with steaks on the menus for a few bucks. For steaks of an entirely different nature – say, Thai ostrich or crocodile – pay a visit to the whimsical Saovaly Restaurant on Manthantourath Rd (tel: 214-940) off Fa Ngum Rd, where you should expect to fork out around $6. Mrs. Saovaly is also known to do a mean Lao sausage. The most indulgent and atmospheric Lao dining by far is at Kualao Restaurant (tel: 215-777, 141 Samsenthai Road). The large mustard-yellow villa features romantic alcoves, high ceilings, tall windows with white gauze drapes and the sort of odd but comfortable turn-of-the-century bric-a-brac you’d find in your grandmother’s place – wooden cabinets, large wall clocks that probably don’t work and teak furniture. There’s a signature dish “with the smell of the water bug”. I sidestepped this and went for Lao-Thai fare which was palate-pinging good, and ample. The excellent alternative set menus served in round wicker trays are relatively pricey at $10-$15 but tasty. Try the purple sticky rice. The place accepts VISA cards. A note of caution here: no one takes Amex. If you do carry Amex, remember to leave home without it. You can draw money against your VISA or MasterCard at Bangkok Bank at 38/13-15 Hatsady Road. And along Lane Xang Avenue (“laahn saang”) before Patouxay is a string of banks – Krung Thai Bank, Siam Commercial and Bank of Ayuddyaha. The other great place for Lao food is Tamnak Lao restaurant (tel: 413-562, 020-511-905). It also owns a patch of lawn that provides a nice setting for dinners. The third must-try spot is the always-packed French Khop Chai Deu (tel: 254-564) on Setthathirat Road. This is in a small villa with packed alfresco dining, and an indoor bar area with a billiard table if you get the urge. Definitely check out the daily buffet from 11.30am to 2pm – a bargain at under US$5. This Vientiane fun guide would be incomplete without the after hours spice. Come late evening, you can start your prowl at On The Rocks, a tiny live music den on Fa Ngum Road by the river which is popular with foreigners. The sleek Chicago Bar (tel:  552-6452) is another popular option, and serves cocktails to a background of blues and jazz tracks, allegedly “from dusk to dawn”. However, a word of caution. Most evening places including discos tend to close by 11.30pm, so if you’re planning to rock this town, set off early. Although, do note that despite early closing times, party-seeking folks still like to arrive fashionably late, preferring a raucous hour of fun to being the first on the scene. There are a few shimmying spots best described as “the nightclubs that time forgot”. These are pale but jolly and often bewildering incarnations of what you might encounter in Hong Kong or Singapore. The next kilometre along Luang Prabang Road heading towards the airport, is livened by sudden bursts of neon and the twinkling lights of a number of disco-bars. The largest and most popular is Marina. It is a decent enough spot and caters more for locals. Future, near the Novotel, is more of the same, louder, with lots of high chairs and small high tables. Last up is Blue Star which is even more local. For a more modern club experience try out the reopened Romeo in the old Odeon Cinema building, or for live music head off to the Red Sun. Gay travellers will not want for entertainment as, for the most part, all of Vientiane’s nightlife is extremely gay-friendly. If you really want a blast, head off-road and, if you’re lucky, you might step on some unexploded ordnance. Over two million tonnes of not very nice stuff was dropped over Laos which makes for half a tonne of explosives per person. That’s a lot by any reckoning. 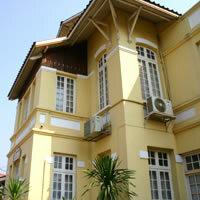 Accommodation choices are fairly limited in Vientiane. There are lots of budget guesthouses from $10 up, some quite nice, and a couple of decent hotels. The first big five-star arrival was the Don Chan Palace in late 2004, although by now it has seen better days. On the banks of the Mekong, this 14-storey resort-style hotel combines conference facilities, with Internet access, sports and fitness and rooms for women travellers. 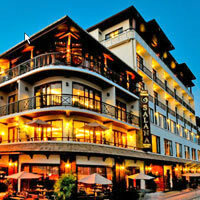 The most stylish hotel in town is undoubtedly the colonial Settha Palace. This is a Raffles in all but name and dates back to 1932. The sumptuous rooms feature four-poster beds, timber parquet floors, long drapes, funky toilets and inroom safety boxes large enough for a laptop. The whole hotel is wireless Internet enabled. There are three more top addresses. The yellow-wash Novotel has been transformed into a modern Mercure Hotel in an easy-to-spot corner property. It has comfortable rooms and a minibar that won’t put a hole in your pockets. Mercure has renovated the pool, restaurant, disco and tennis court so expect newish facilities. Some rooms have Internet sockets but the whole place is wireless Internet enabled. Incredibly, this used to be a student dorm in days gone by. And just in case you brought them along with you on your flight, “pets are not allowed”. Good place, good service. If you’re shopping for Vientiane boutique hotels, check out the Ansara Hotel, housed in a colonial building on a quiet street downtown. The Ansara offers full-amenities, 12 well-appointed rooms and two suites on nice grounds including a popular French restaurant. Expect free high speed Internet and a personal laptop in every room so you can surf the web and even print free of charge. Another spot that advertises itself as a cheap and cheerful alternative is the 41-room Salana Boutique Hotel. This corner property offers a lot of prime balcony space for monk watching and catching glimpses of the Mekong. WiFi is offered throughout but service is spotty in some rooms so be sure to check before you move in. Conference rooms are available, as is a stocked business centre. The onsite restaurant serves up Western and Asian dishes. Rooms can be small but the location is hard to beat. The modern but bland Lao Plaza Hotel is centrally located. It is one of the larger hotels around and has extensive facilities from fitness centre and sauna/massage (in Thai style pavilions) to meetings rooms. Guestrooms are in pastel tones with carpets, satellite TV, and a safe that can hold a small notebook. This is a good place to pick up a hotel car in a hurry if you’re stuck. You can rent a Toyota Camry for $19 an hour or $63 half day and $125 for a full day. 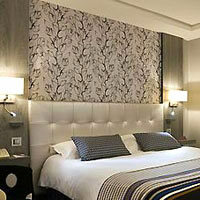 A terrific alternative is to grab a room at the new and rather swish Parkview Executive Suites, close by the Mercure. This is a smart residence, oozing ambience with a tennis court and pool. The rooms feature kitchenettes with fridge and are internet-enabled, although the WiFi rate of US$4 an hour/ US$10 a day seems a bit steep. The two and three-bedroom suites are fully equipped with washer and drier though guests at smaller units (which start at a generous 46-57sq m) can avail of free laundry machines downstairs. This is a very comfortable choice but not right in the heart of things. The modern and compact Tai-Pan has been transformed into a Best Western and in the process was scrubbed up and renovated into a fine business hotel with 44 rooms on four floors, complete with assorted facilities including in-room WiFi, a proper business centre, pool, fitness centre, in-room movies and friendly English speaking staff. From here things start to nosedive pretty fast. 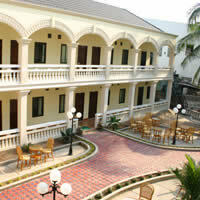 The intermediate hotels of note include the Lao-style Hotel Lao which is quite pleasant if a little bare-bones. There is also the Royal Dokmaideng Hotel (garishly modern with something resembling golden Louis XIV carriages emblazoned around every street-front window), the old, musty state-run Lane-Xang Hotel by the river which is certainly friendly and welcoming, and the out-of-the-way Angkham Hotel (formerly the Golden Bowl Hotel) which recently toned down its glitzy Vegas-style furniture for more faux-European décor. The large rooms and suites come equipped with programmable key safes (a rarity here). Staff everywhere are extremely polite and accommodating. Occupying a convenient corner at one end of Fa Ngum Road with several rooms looking onto the river, is a great little find, the Inter Hotel. Don’t be put off by its odd name. This tiny place has been refurbished and has quite a boutique feel to it in a simple kind of way. Staff members are very helpful and speak good English. The rooms are huge and rather bare but cosy enough with satellite TV and a large cupboard and desk. This hotel offers great river views and yes, there’s hot water. Mark it down. A garden option, popular with the French, is Le Parasol Blanc Hotel which has basic “cottages” with thatch walls and parquet flooring near Patouxai (Victory Monument), as well as a sister hotel up in Luang Prabang. Rooms are airconditioned with TV, fridge and hot water. A newer choice, close to Lao Plaza is the bright and cheerful Hotel Day Inn whose charming rooms feature pistachio-green walls, rattan furniture, TV and fabulous toilets. Internet connections are possible at Kp300 per minute. Worth a peek. There is a welter of guesthouses in Vientiane and it seems anyone with two rooms and a stove is running a service for foreigners. These range from pretty awful to spectacular, so shop carefully and enquire about aircons and hot water. The best guesthouse by a long chalk, better than a lot of the hotels, is the tucked-away Lani Guest House. This is an old house (reminiscent of a New Delhi home) in a small, lush garden with plenty of trees. 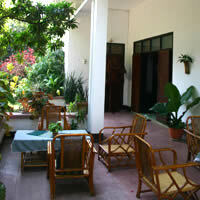 There is a very pleasant dining area along the verandah and rooms are simple and clean without TV or fridge. If you’re looking for a great guesthouse or something just under a hotel, this is it. Lani is very centrally located and walking distance from most places. Other small hotels and guesthouses if you are stuck, include B&P Hotel, Orchid Guest House in a cool old building (by the river), Mimi Guest House, the tacky but great value Phonepaseuth Guest House (request a balcony room), the cringingly ornate but central Haysoke Guest House, the lovely if increasingly over-priced Mali Namphu Guesthouse (with a nice enclosed courtyard), and the pretty decent Vansana Hotel (with satellite TV and swimming pool). For a place downtown there is the Vayakorn House with aircon, TV and hot water, while a bit farther out (which beats the whole purpose of staying in a small place like Vientiane) is Villa Sisavad (popular with the French). Internet cafes abound, especially in the river area, and one place to try is the riverfront Phet-Phim (also a guesthouse, tel: 252-757, phetphim@yahoo.com) which charges Kp200 per minute. There’s also a small obliging strip along Sehtathirad Rd that caters for overseas calls, Internet and post notices. And for shopping, there’s nothing like a slow browse through the silks and curios and what-have-you of the Morning Market, that despite its name runs all day from around 7am to 5pm. Silk scarves run from US$7 to $35 and more depending on quality of the weave. Bargain, and then bargain some more. Upcountry, though, is where the soul of Laos resides. It would be criminal to consign Luang Prabang to a few paragraphs. See our detailed Luang Prabang guide. 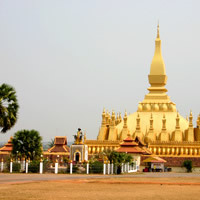 This is the historic and cultural heartland of the country, high in the cool mountain air, on the banks of the Mekong. Suffice it to say, Luang Prabang is well worth a two or even three-day trip and it will likely form the cornerstone of your visit with temple walks, cave exploration and river journeys. One company that can arrange a suitable adventure is Tiger Trail run by the young Markus Peschke (which also runs an elephant and adventure camp just outside Luang Prabang). There are several charming guesthouses to choose from in this unspoiled, laid-back town but the top addresses for colonial decadence and atmosphere are the Villa Santi Resort (along with the Villa Santi Hotel), The Grand, the chic and characterful Satri House, the La Résidence Phou Vao (a Pansea-Orient Express hotel) and the charming new Hotel de la Paix. All offer villa-style escapes with plenty of timber and creaking floorboards. On the highway to Luang Prabang, an excellent one-day option from Vientiane is Vang Vieng. The town was once a tiny, relaxing hippy hangout (and probably still is, off peak) but has since been turned into party central by young booze-loving backpackers. Lao-style long-tail boat tours of the river cost around Kp40,000 (US$4) for an hour. The Nam Song River is scenic with stunning limestone outcroppings shaping the valley. Tham Jang is the most popular of the caves and is easily reached by driving, cycling or walking through the Vang Vieng Resort (which actually charges Kp1,000 per person “trespassing”). You cross a bright orange bridge and then 145 breathless steps take you straight up to the cave entrance. The interior walks are well arranged and lit so you can enjoy the stalagmites and stalactites. From up here it is possible to appreciate the winter haze as the entire countryside seemingly set about burning farms to set up for the next season. After the rains every now and then the views suddenly return – and they are stupendous. A nice spot to enjoy the scene is the simple but very adequate Bungalow Thavonsouk with white-balcony Suites fronting the river. There’s aircon, hot water, clean toilets and lots of flowers and creepers all over the grounds. Just across the road, also on the river, is the larger and equally clean, refurbished Villa Nam Song. Villa Nam Song (formerly Hotel Nam Song) offers 16 air-conditioned rooms (enlarged with new bathrooms), a decent wine menu and a pleasant location. The Vang Vieng Resort has small cottages in a garden setting for $5 while farther out of town the Phoudingdeng Organic Mulberry Farm runs a handful of rooms for about the same price. Rooms have fans and just one has hot water. The small farm is green and attractive, runs a very pleasantly-sited restaurant, and is the jump-in spot for Vang Vieng’s most popular sport – tubing. These large (and painfully pink) truck tyre tubes are rented for $3 for a two-hour excursion. Grab a tube, hop onto a tuk-tuk, head to the farm, leap into the river and float serenely back to Vang Vieng market. People do this over and over again. 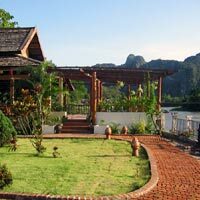 Another option in Vang Vieng is the Thavonsouk Hotel and Resort set amongst well-kept gardens on the banks of the Song River. It has a good range of budget accommodation but also some more upmarket choices including private raised bungalows designed and built in the traditional teakwood Lao style. A basic double, with airconditioning, private bathroom, television, and private balcony, will set you back US$30 per night in high season. The Sunset Restaurant and Bar, serving Lao, Vietnamese, Chinese, Thai and Western cuisine, offers views of the river and Phadeng (Red Cliff). Kayaking and exploring the river and caves costs about $12 for a day or $8 for a half day. A company like Wildside (tel: [856-23] 511-440, e-mail: info@wildside-asia.com) can arrange this. My driver also proceeded to show me the more modern sights of the area, including a cement factory which is a blot on the landscape. Places to eat include Nangbot (good Lao and Thai), Nazim for Indian and several tacky pizza places where the pink-tube people hang out. 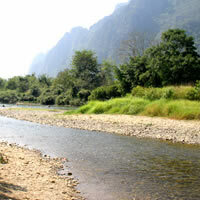 Vang Vieng is 150km from Vientiane and a two-and-a-half-hour drive on Route 13. On the way back, stop at Hin Hoep and stroll the narrow bridge over the Nam Lik River near the confluence. A diversion through the twisty Route 10 will bring you back to Vientiane through some very scenic areas including the Ang Nam Ngum reservoir and dam. This is a popular picnic area. Hotel rack rates quoted here may be subject to 10 percent government tax and 10 percent service charge. Some smaller establishments will require payment in advance. Guesthouses may not always have hot running water, aircon, TV or fridge. The exchange rate is around US$1 = Kp7,889 and Thai Bt100 = 25,637. Airport departure tax is US$10, and so, sometimes, are border crossings by land. There is an executive lounge for frequent fliers and business-class passengers of Vietnam Airlines and Thai Airways. However, other passengers may avail of this too for $5. The airport has a small duty-free selection, scarves, Johnnie Walker and a huge range of wines. Lane Xang Travel. Tel: [856-21] 213-198, fax: 215-804, (e-mail: lxtravel@laotel.com or www.lanexangtravellaos.com). Tiger Trail. Tel: [856-020] 557-0221, tel/fax: 071-252-655, (e-mail: info@tigertrail-laos.com or www.laos-adventures.com). Anou Hotel. Tel: [856-21] 213-630, fax: 213-632, (e-mail: anouhotel@laotel.com). Angkham Hotel (formerly Golden Bowl Hotel). Tel: [856-21] 900-011, fax: 900-010, (e-mail: reservation@anghkhamhotel.com or www.angkhamhotel.com). Ansara Hotel. Tel: [856-21] 213-514, fax: 213-523, (email: info@ansarahotel.com or www.ansarahotel.com). Best Western. Tel: [856-21] 216-906, fax: 316-223, (book.bestwestern.com). B&P Hotel. 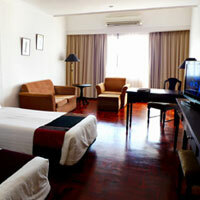 Tel: [856-21] 241-694, fax: 240-916, (e-mail: bnphotel@hotmail.com or www.bp-hotel.com). Don Chan Palace. Tel: [856-21]262-193, (e-mail: donchanpalace@laopdr.com or www.donchanpalacelaopdr.com). Hotel Day Inn. Tel: [856-21] 223-847, fax: 222-984, (www.day-inn-hotel.com). Hotel Lao. Tel: [856-21] 219-280, fax: 219-282. Inter-city Hotel. 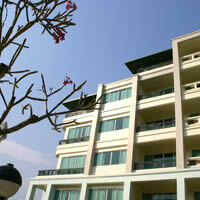 Tel: [856-21] 242-843, fax: 215-137, (e-mail: interhotel@laopdr.com or www.interhotel.laopdr.com). Lao Plaza Hotel. Tel: [856-21] 218-800, fax: 218-808, (e-mail: lph@laoplazahotel.com or www.laoplazahotel.com). Lane-Xang Hotel. Tel: [856-21] 214-102, fax: 214-108, (www.lane-xang.com). Le Parasol Blanc Hotel. Tel: [856-21] 215-090, fax: 222-290. Mercure (formerly Novotel). Tel:[856-21] 213-570, fax: 213-573, (e-mail: resvn@mercurevte.com or www.mercure.com). Parkview Suites. Tel: [856-21] 250-888, fax: 250-777, (e-mail: parkview@laotel.com or www.parkviewexecutive.com). Royal Dokmaideng Hotel. Tel: [856-21] 214-455, fax: 214-454, (e-mail: laoroyal@laotel.com or www.mekongexpress.com). Salana Boutique Hotel. Tel: [856-21] 254-254, fax: 254-250, (e-mail: wecare@salanaboutique.com or salanaboutique.com). Settha Palace. Tel: [856-21] 217-581, fax: 217-583, (e-mail: settha@laonet.net or www.setthapalace.com). Vansana Hotel. Tel: [856-21] 413-895, fax: 413-171, (e-mail: vansana@laotel.com or www.vansanahotel-group.com). Lani Guest House. Tel: [856-21] 215-693, fax: 216-103, (e-mail: info@laniguesthouse.com or www.laniguesthouse.com). Mali Namphu Guesthouse. Tel: [856-21] 215-093, (e-mail: malinamphu@comcast.net). Mimi Guest House. Tel: [856-21] 250-773. Orchid Guest House. Tel: [856-21] 252-825, fax: 216-588. Phonepaseuth Guest House. Tel: [856-21] 212-263, fax: 261-395, (e-mail: pangkham_gh@yahoo.com). Vayakorn House. Tel: [856-21] 241-911, fax: 241-910, (e-mail: vayakorn@laotel.com or www.vayakorn.com). Villa Sisavad. Tel/fax: [856-21] 212-719, (e-mail: thongtsa@laotel.com or www.villasisavad.com). Thavonsouk Hotel and Resort. Tel: [856-23] 511-096, fax: 511-215, (e-mail: thavonsouk@hotmail.com or www.thavonsouk.com). Villa Nam Song. Tel: [856-23] 511-016, fax: 511-016, (e-mail: reservation@villanamsong.com or www.villanamsong.com).